That is, the volume of a given quantity of gas, at a constant temperature decrees with the increasing of pressure and increases with the decreasing pressure. Let, a Cylinder contain 10 ml of gas, at constant temperature and 1 atm pressure. if the pressure increases to 2 atm then the volume also decrees to 5 ml. a. Nature of the Gas. b. Mass of the Gas. Where, V1 and V2 are the volume at P1 and P2 are the pressure respectively. The relation between pressure and volume can be represented by an arm of rectangular hyperbola given below. As the value of the constant in equation will change with temperature, there will be a separate curve for each fixed temperature. These curves plotted at different fixed temperature are called isotherms. At Constant temperature a given mass of an Ideal Gases the product of Pressure and Volume is always same. if the product of pressure and volume represents in Y axis and Pressure represents X axis a straight line curve is obtained with parallel to X axis. 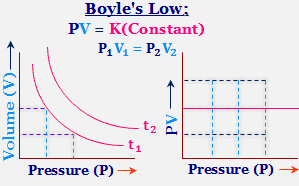 This Graph is shows that, at constant temperature the product of pressure and volume is does not depends on its pressure. At constant temperature(T) a definite mass of gas has pressure P1 at volume V1 and pressure P2 at volume V2. Thus, at constant temperature density of a definite mass of a gas is Proportional to its Pressure. At constant pressure a definite mass of gas, with the increasing of temperature, volume also increases and with decreasing temperature, volume also decreases. That is, the volume of a given mass of gas at constant pressure is directly proportional to its Kelvin temperature. At constant pressure, each degree rise in temperature of a definite mass of a gas, the volume of the gas expands 1/273.5 of its volume at 00C. If V0 is the volume of the gas at 00C, then 10C rise of temperature the volume of the gas rise V0/273.5 ml. = V0 (1 + 1/273) ml. = V0 (273 + t°C)/273 ml. 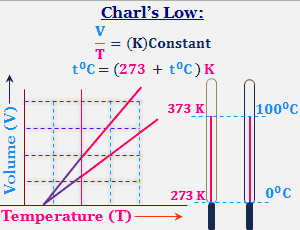 It is convenient to use of the absolute temperature scale on which temperature is measured Kelvin(K). A reading on this scale is obtained by adding 273 to the Celsius scale value. Where K2 is constant whose value depends on the, Nature, mass and pressure of the gases. At constant pressure the volume of a given mass of gas is directly proportional to its Kelvin temperature. A typical variation of Volume of a gas with change in its kelvin temperature a straight line plot was obtained, Called isobars. The general term isobar, which means at constant pressure, is assigned to these plots. Graphical Representation of Charl's Low. Since volume is directly proportional to its Kelvin temperature, the volume of the gas is theoretically zero at zero Kelvin or - 2730C. However this is indeed hypothetical because all gases liquefies and then solidity before this low temperature reached. In fact, no substance exists as a gas at the temperature near Kelvin zero, through the straight line plots can be extra plotted to zero volume. The temperature corresponds to zero volume is -2730C. Again, the mass of the gas is M.
Density D1 and D2 at the Volume V1 and V₂ respectively. Thus at constant pressure, density of a given mass of gases is inversely proportional to its temperature. V ∝ 1/P When T Constant. V ∝ T When P Constant. Thus the product of the pressure and volume of a given mass of gas is proportional to its Kelvin temperature. At 1 atm pressure and 300 K temperature, the volume of the gas is 2000 cm3, then calculate the volume of this gas at 600 K temperature and 2 atm pressure. Here, P1 = 1 atm; V1 = 2000 cm3 and T1 = 300K and P2 = 2 atm; V2= ? and T2 = 600 K.